You are here: Home / It’s Finally Patio Season! 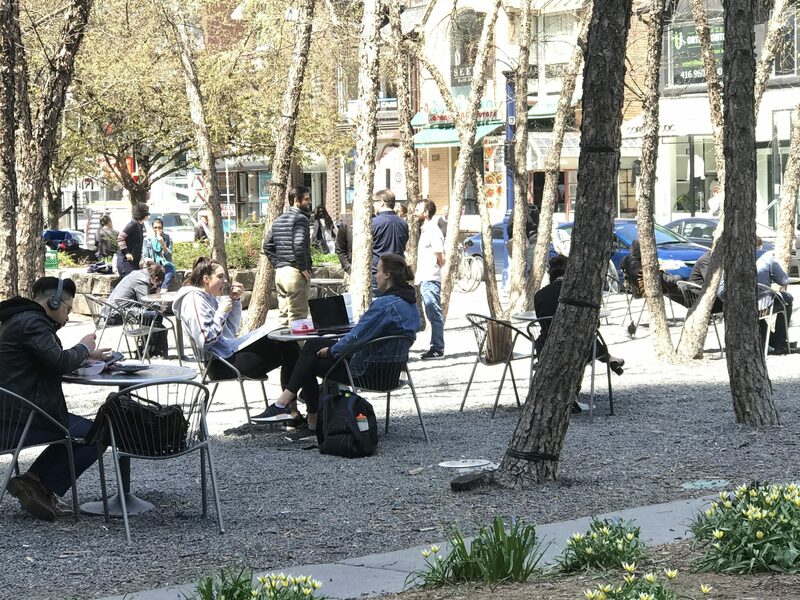 Mother Nature is finally on our side, and with warmer days ahead in our forecast, patio season fever has started in the heart of Bloor-Yorkville. Check out our list of our neighbourhood restaurants who offer an outdoor space. Bar Renya has been mentioned in several Toronto blogs this year, as a highly-rated, new patio favourite. Located on Cumberland street, people-watchers will enjoy the comfort of the front patio. Those looking for a more secluded area to relax outside, Bar Renya offers a wonderful backyard-like space. With string-lit trees, wooden walls with potted plants, the ambiance is an excellent getaway for the lunchtime crowd. Located adjacent to the Frank Stollery Parkette on Scollard Street at Davenport, Café di Portici offers both sun and shade on this sidewalk patio. Try their Spring Special Pasta with asparagus pesto, green beans, asparagus, marinated artichoke and Parmigiano Reggiano cheese ….yum! Tucked away off Yorkville Avenue, Chabrol brings the feeling of Southern France to Bloor-Yorkville. This outdoor space is French-inspired with bistro sets, interlocking brick at your feet and old-fashioned lanterns, which are candlelit in the evening. For the wine and cheese lovers, this is the place to be. Bon Appetit! Cibo Wine Bar offers a small patio, that brings the décor of inside to outside. With their relaxed ambiance, patio-lovers flock to taste one of Cibo’s famous pizzas. As ‘wine’ is part of their name, Cibo Wine Bar has an excellent wine list. Why not bring a friend and have a glass (or two) and share an antipasto (or two)? dBar, located at the Four Seasons Hotel, invites visitors to join them on their patio for a dbar classic. aptly named Yorkville Affair, this coctail is a mix of Rose Infused Gine, Rose Pedals, Elderflower Liqueur and White Cranberry. Patio-lovers can also enjoy a light snack from their Bar Bites menu, while relaxing under elegant umbrellas, surrounded by beautiful shrubbery. Overlooking Bloor Street, this is a popular spot to go for after-work drinks. Unwind outside with a pint and enjoy some British fare from their expansive menu. The Flight Deck at The Pilot has been a favourite spot for the after-work and lunch-time crowd for years. This hip patio, decked out with stainless steel, gives the option for full sun, or staying cool in the shade under an awning. If you are looking for Ontario beer, there are plenty on tap aboard The Flight Deck. Boasting four patios, Hemingway’s has been a favourite for decades for their beer selection and live music on Friday nights. Summer or winter, patrons can always enjoy the patio scene at Hemingway’s, as they have excellent heaters and coverage for snow. The same coverage keeps the sun away, for those who are looking to keep cool, while enjoying some New Zealand lamb, and a glass of one of their Kiwi wines. Treat Mom to a Mimosa on Sunday! Kasa Moto’s rooftop patio is very popular amongst those who love to mingle, wine and dine on Japanese fare. This popular patio seats up to 180 guests, with beautiful greenery it offers a chic and shady atmosphere to relax in. At night, the patio creates a lounge feel, and has become one of the most popular spots for nighttime excitement in Bloor-Yorkville. The second-floor terrace is the perfect spot to catch the hustle and bustle of the Mink Mile. On Thursday’s, La Société offers $1 East Oysters from 4-8 p.m. and specials on their bottles of Veuve Clicquot Champagne. 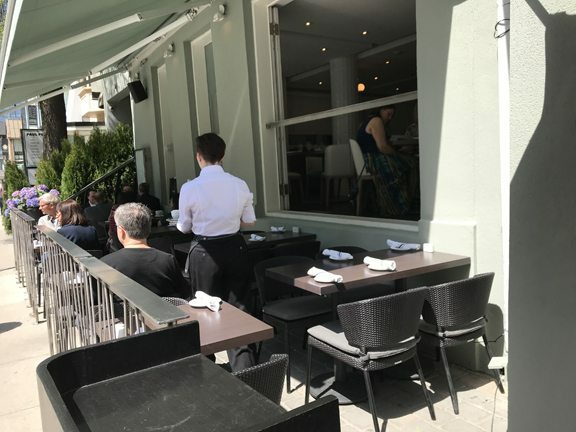 Sitting alongside the beauty of the greenery and flowers which surround One Restaurant’s patio, guests can enjoy upscale dining, while enjoying the bustling street life at the corner of Yorkville Avenue and Hazelton Avenue. At night, sit back and enjoy the candlelight, while sipping on one of One’s signature cocktails! A Bloor-Yorkville classic patio, and recently updated! For years star-gazers have passed by, hoping for a glimpse of a celebrity. The patio is enjoyable, and situated across from the Village of Yorkville Park. Sit back and sip on their sangria red, made with Inniskillin Pinot Noir, pomegranate liqueur, fresh orange juice and a medley of fruits. Check out the muted tones on Sassafraz’s freshly painted exterior! For the utmost quiet, visit our hidden gem of a patio at Scollard Deli. Located in the back of this Scollard Street location, you will sit beside beautiful mural of a hillside in Greece, with a peaceful serenity, making this patio a place to slow down and catch a breath, a soup and deli sandwich. STK is one of Bloor-Yorkville’s new neighbours, and was the talk of the town before they even opened. The décor is stunning, and the large windows were designed in such a fashion that the second floor can convert to a patio. Airy, and covered, guests are treated to an outdoor space, while dining on one of the city’s most mouth-watering steaks. The best view of the CN Tower that Bloor-Yorkville has to offer, is located on the 51st Floor of the Manulife Centre, at The One Eighty. Enjoy a romantic dinner, or a light lunch with an unforgettable backdrop! The Oxley has two patios to choose from. On the sidewalk, diners will have the opportunity to enjoy the company of friends, while people-watching on this buzzing neighbourhood street. The back patio is a quiet spot to enjoy traditional English pub fare. Trattoria Nervosa also has two patios to choose from. The rooftop offers a quieter and cozy setting. While the sidewalk space offers full sun, surrounded by beautiful rod-iron fencing with gorgeous hanging flower baskets. The Italian fare restaurant is a celebrity hot-spot. Try the delicious Mafalde ai Funghi, and keep a discreet eye out for a famous face! Looking for an intimate patio? Look no further than the Windsor Arms. Their patio has loveseat seating, and candles to light up a warm summer night. Raise a glass and toast love in this romantic setting. If you are looking for a quiet nibble on your own, we have set up our tables and chairs in the Village of Yorkville Park. Relax by the Rock!